Mobile hardware isn't one-size-fits-all, and different device form factors have differing needs when it comes to processing power, thermal limits, and battery consumption. That's especially true when we're dealing with the constraints inherent to wearables, yet so far many of the most popular smartwatches have been based around chips initially designed for larger phones. Earlier this year we learned about Qualcomm's efforts to finally do something about that, announcing the Snapdragon Wear 2100 SoC – one engineered with the specific needs of wearables in mind. 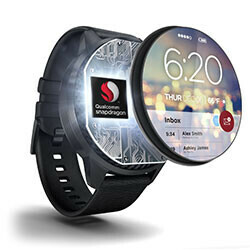 Now Qualcomm's sharing word of its latest entry in the new Snapdragon Wear family, its new 1100 chip. Like the 2100 before it, the main benefits of the Snapdragon Wear 1100 are its low power consumption and small physical size. But while the 2100 is intended for more general-purpose wearables like smartwatches, Qualcomm is positioning the 1100 for slightly lower-demand use cases such as fitness trackers, notification bands, and other applications where the 2100 might be overkill. Don't let those suggested product types have you thinking that the Snapdragon Wear 1100 is underpowered; the chip boasts features like hardware security (for possible mobile payment purposes) and an advanced location-tracking engine. We're not yet sure who will be the first manufacturers to build wearables around the 1100, but we shouldn't have to wait long to find out; Qualcomm reports that the chip is available for use immediately, and is shipping to interested companies as of today. Fitbit or Samsung maybe on of the first users of this chip.